We invite you to explore India - the Land with infinite beauty ! Whether you soar high into Himalayas or peer under the ruins of the Ancient monuments dotting the landscape of India, you will cherish the experience long after your visit ! This India Travel Guide on Basilica of Bom Jesus is free from any commercial interest! This site is dedicated to promote India - the vast subcontinent, its glorious past, magnificent landscape and its infinite variety. Along the Mondovi River lies the Old Goa - Velha Goa - punctuated by some of the greatest old Churches of India - monument to Portuguese colonial Past. About 10 km east of Panaji - the tiny state of Goa's capital, stands the first minor Basilica in India - Bom Jesus Basilica - built in the year 1594 - a finest baroque architectural masterpiece. The layout of this massive cathedral reflects of its time - Renaissance period but the intricately gilded altars decorated with frescoes are unmistakably Baroque. Exquisitely carved basalt embellishments make this 16th century church a veritable work of art - with columns covered in white marble and inlaid with precious stones. Basilica of Bom Jesus - literally Good Jesus in Portuguese is dedicated to Infant Jesus - has three storied facade having a main entrance flanked by two side entrances. The facade has molded basalt casings with laterite buttresses. At the top is the 'I H S' Greek letters signifying Jesus and the main altar has Infant Jesus and above the Altar is a large statue of Saint Ignatius Loyola with a medallion marked with 'I H S'. This altar is flanked by 2 altars - with one altar bearing larger than life sized gold gilded statue of Our Lady of Hope and the other altar of St. Michael . 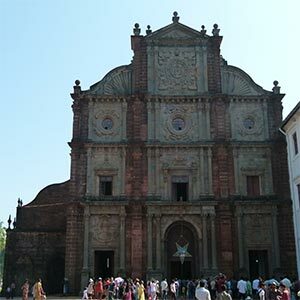 This Basilica is renowned in the Catholic World for another reason - it houses the sacred relic of Saint Francis Xavier - Patron Saint of Goa, co founder of the Society of Jesus (along with Saint Ignatius Loyola), and the indomitable traveler who spread the message of Jesus through out India, Japan and China. Saint Francis Xavier traveled extensively and as he was adept in many local languages, could easily spread the Gospel. As we mentioned in this series on Basilicas in India, he had covered most of the present day minor Basilicas in Southern India on foot. He died in the Chinese Sancian island on his way to Malacca in 1552 at the age of 46. His body, which is miraculously preserved for centuries despite repeated burials and exhumation, even after subjected to being buried under a pile of lime in the earlier burial time, is kept in a Silver Casket atop a richly carved wooden mausoleum in this basilica. St.Francis Xavier's sacred body is brought down for public veneration once in a decade in the recent times. St.Francis Xavier is credited with hundreds of miracles throughout the period and hence this basilica attracts thousands of visitors from all over the world. This basilica is one of the UNESCO World Heritage Sites in India. Hardly at a distance of a stone's throw lies another spectacular Church SE Cathedral - the largest Church in Asia with the largest bell in Asia - Golden Bell in its belfry. Nearby you will find another 16th Century Church - St. Francis of Assisi and within a short distance is the St. Cajetan Church - magnificent white church modeled after St. Peter's Basilica in Rome. Old Goa - Velha Goa is renowned for centuries old Catholic churches. Masses are conducted in Konkani, English, Hindi, Marathi, Tamil, Malayalam, Portuguese and Spanish.